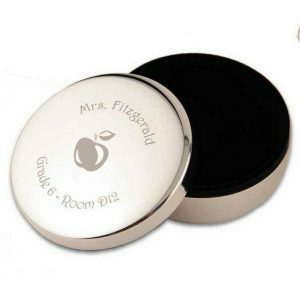 A round silver box that can be used for paper clips or coins that will be like bringing an apple every day to a favorite teacher. This charming box is adorned with a shiny apple and can be personalized with the teacher’s name, grade and room number. It makes a wonderful reminder for the teacher that has a special student who appreciates her. A charming desk organizer can make a special gift for a teacher when you personalize it with the name and some words of gratitude for all of her encouragement. An extra special teacher deserves some well deserved recognition for her dedication and hard work. This unique and attractive jade apple acrylic plaque can make an outstanding gift from a student or from the faculty as an award for a job well done. Shaped like an apple and sitting securely on its own stand, the plaque is personalized with the teacher’s name and two lines of special words etched forever as a fond memento that she will treasure. A white ceramic coffee mug that is more than just a token of your appreciation. 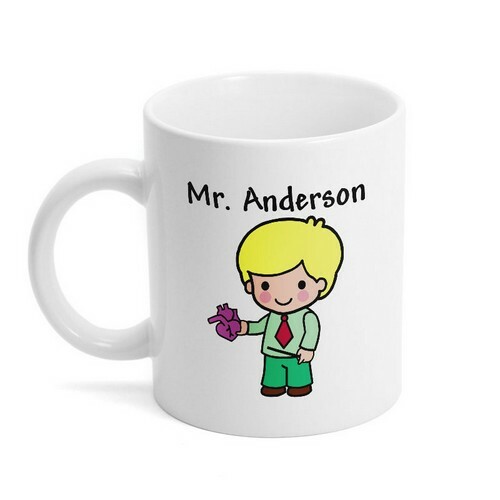 It is customized to fit the person who is receiving it as you can not only put their name on the mug, but you can add their hair color and skin tone to make it resemble your favorite teacher. A truly personal gift that the teacher will enjoy every day with their daily cup of Joe! 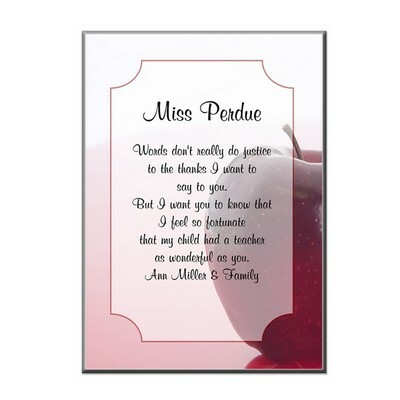 You can send a heartfelt message to your favorite teacher every day with this distinctive plaque that not only provides her with the proverbial apple a day, but also includes your own personal message to make it a very touching gift that will be most appreciated! 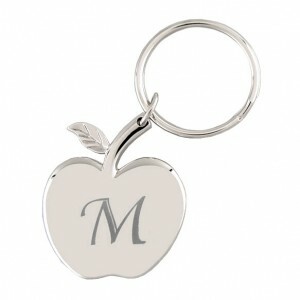 A silver apple key chain is a creative way to tell your teacher how much you appreciate their efforts. The apple shaped charm can be personalized with your teacher’s initial so they will always know where to find their keys. 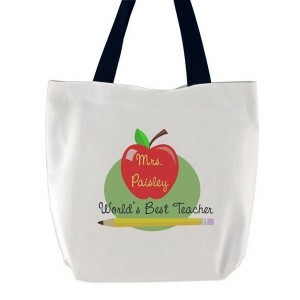 The World’s Best Teacher will be elated to get this roomy tote bag that she can use to take home all the homework her class gives her! A bright red apple can be personalized with her name so no one will ever be able to steal it away from her! 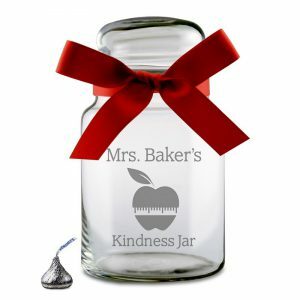 What teacher wouldn’t want this adorable desktop candy rewards jar? Particularly when you personalize the teachers name and the type of rewards jar it is. Fill it up with your teachers favorite candy or snack and watch quickly disappear! 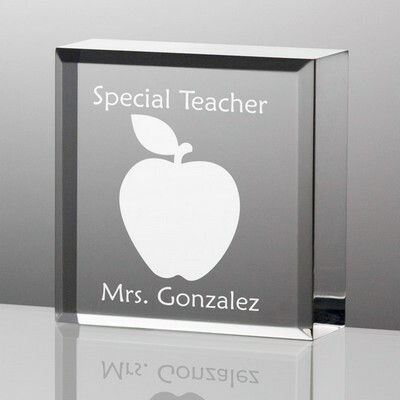 Any teacher who receives this adorable acrylic block will love to show it off on his or her desk. 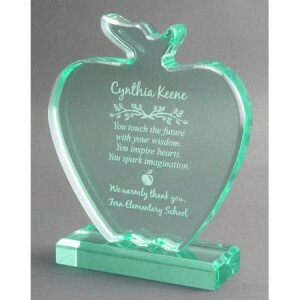 With an embossed apple sitting center stage, this gift can be personalized with the teacher’s name so they will know that they are indeed very Special! 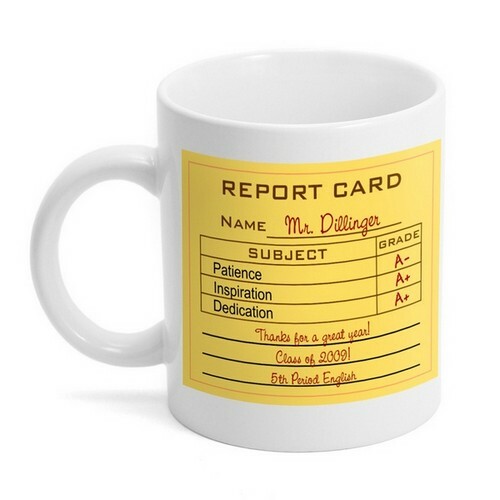 Your teacher will appreciate that you give him or her high marks for what they do for you with this white ceramic Report Card mug. It will be a long lasting reminder that they are really appreciated. You can add a personal touch with the teacher’s name, some words of wisdom or thanks! A token of your appreciation, no matter how big or small, will be a great tribute to those teachers that do so much for you. 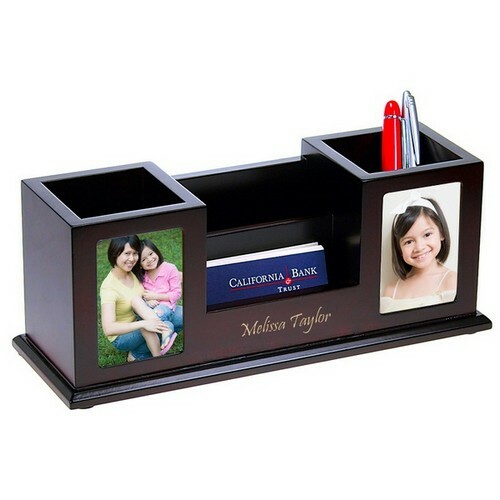 Giving a personalized teachers gift is a wonderful memento for any teacher from one their favorite students.